– Cameroon is the first African country to reach the quarter-final in soccer world cup. – The official languages in Cameroon is French, English. They also have other native African languages. – Cameroon celebrated its first independence day from the France and England on October 1, 1960. – More than 30% of the total population lives at less than $1.25 per day. 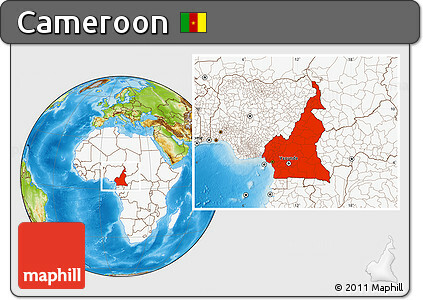 – Cameroon is famous for producing coffee, cocoa, cotton, bananas and oilseeds. – Cameroon has the tallest mountain in West Africa, Mount Cameroon. – Cameroon is one of the wettest lands on the earth with annual rainfall of about 1028 cm. – Cameroon is a Portuguese word meaning River of Pawn. – The Cameroon flag has a star and three colours; green for vegetation, red for independence and yellow for sunshine. Capital City: Yaoundé is the capital of Cameroon and, with a population of approximately 2.5 million, the second largest city in the country after the port city Douala. It lies in the centre of the nation at an elevation of about 750 metres above sea level. Religion: Cameroon culture consists of numerous religions including Christianity (about 69%), Islam (about 21%), and many other indigenous religions. The citizens of Cameroon are entitled to freedom of religion, as it is stated within their constitution.